The 3rd and newest generation of Televic’s renowned Con dea Wireless Conference system uses the latest advances in wireless technologies to offer more stability, more exibility and more security. All including the globally recognized superior sound quality. Confidea Wireless G3 is so exible, so easy to set up and so convenient to use that it is ideal for rental applications, town councils, boardrooms, hotels and universities. A system is set up and torn down in only a few minutes. It is therefore great for temporary set-ups or for multi-purpose rooms. Basic systems should require basic investment. In its simplest form, a Con dea system requires very few hardware and software components. For a basic discussion system the Con dea Wireless Conference Access Point (WCAP) acts as a mini central unit. 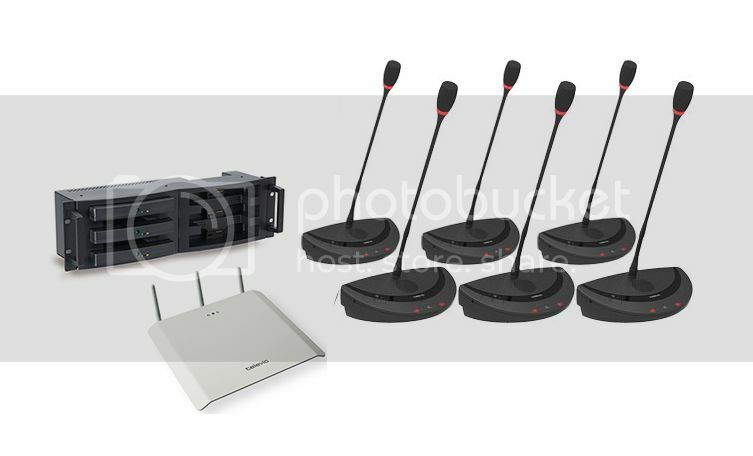 The provided audio in- and outputs make it easy to connect a handheld (wireless) microphone, a room audio system, a video conferencing system or a telephone hybrid system. The new access point has a powerful built-in webserver, so that you are in full control of the system from any desktop computer, laptop, tablet or smartphone. For simple discussion applications, the intuitive user interface offers all functionality you need as an operator, ready to use without specialized software training. A set-up with voting is managed through the CoCon Control Software and the voting units even offer RFID authentication. The AES encryption, combined with the proprietary communication protocol and access control, offers 3 layers of security and con dentiality at a level not seen in any product of this class. Your sensitive meetings are secure and your IT people reassured of a perfect coexistence of the system with your wireless LAN. 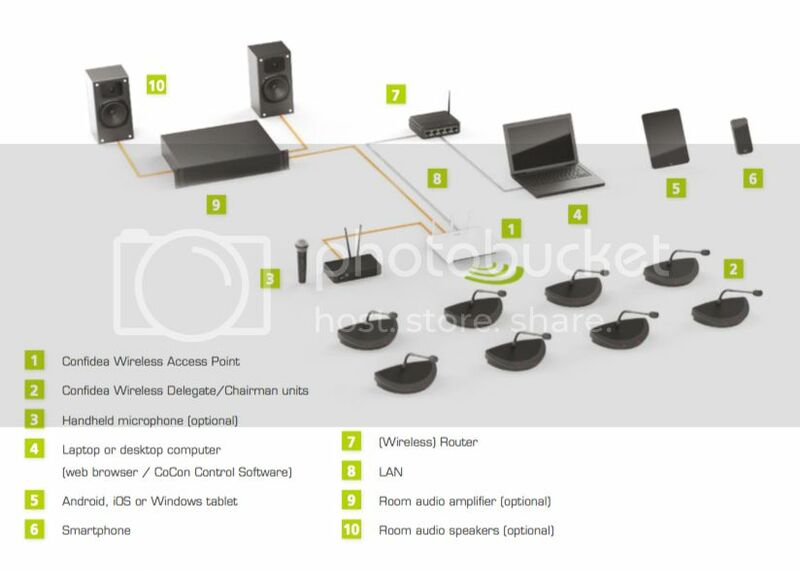 The Con dea wireless conference system uses the 2.4 and 5 GHz frequency range, providing a large number of channels in 4 different bands that guarantee a reliable wireless link at any time. The access point has a built-in spectrum scanner that continuously monitors the 4 bands to detect interference sources and identify free frequencies. This way, the access point is able to automatically switch - glitch-free - to a ‘clean’ frequency for a reliable RF link. The multitude of possible operating frequencies and the advanced spectrum management make the Con dea system the ideal solution for buildings where multiple systems are operational in adjacent rooms. The Confidea Wireless Conference Access Point (WCAP) has built- in web control that can be accessed from any PC, laptop, tablet or smartphone using a standard (mobile) internet browser. The built-in web pages allow for set up of the system, but also control and monitoring during the meeting. From the web interface, microphones can be activated or switched off. Also the battery condition of each unit can be checked and monitored without disturbing the ongoing meeting. 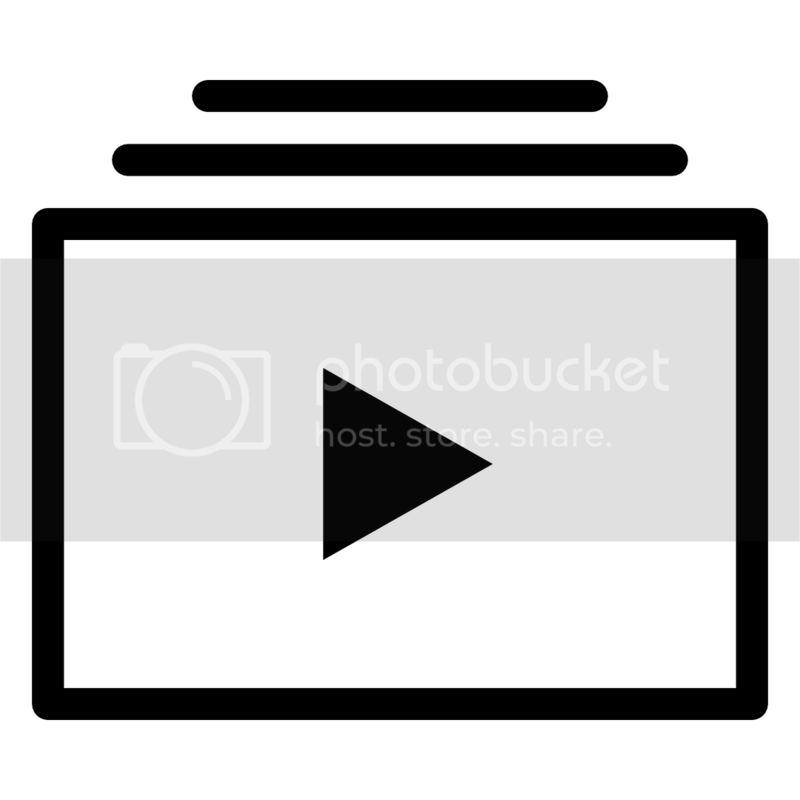 The possibilities of the web interface are extensive. For basic discussion systems, this eliminates the need for specialized, dedicated software and software training. The charge indicator on the battery instantly reveals the condition of the battery, even before the system is switched on and operational. It eliminates any doubt about the condition of batteries before the start of the meeting. A fully charged battery will give you 28 hours of operation. The Con dea Charging Tray is rack mountable and quickly charges 6 battery packs simultaneously in only 2,5 hours. Multiple chargers can be daisy-chained via a power loop-through to create a bulk charging station.